​I am known as Kenny Fox, and to my family as Llewellyn. 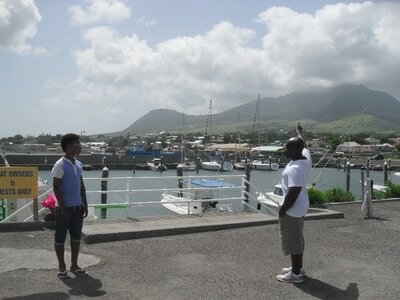 I was born in St Kitts in the Caribbean and thought of myself as a ‘small islander’. Caribbean people will know what I mean by this. Jamaicans tease us ‘small islanders’. Now I know that I am an African - as we all are - but that wasn’t what I was taught in school. We were secure in the understanding that we were British citizens, since St Kitts was a British Colony. Only later as a man, did I learn that Black people in the Caribbean are the descendants of African slaves who survived the ‘slave-trade triangle’. Now I know that wherever you live in the world, that if you are Black, you are African. I came to England aged ten, having been ‘sent for’ by my mother, who had herself come to England when I was a baby in the 1950s. I was raised by my maternal grandmother, Maria Taylor, in St Kitts. 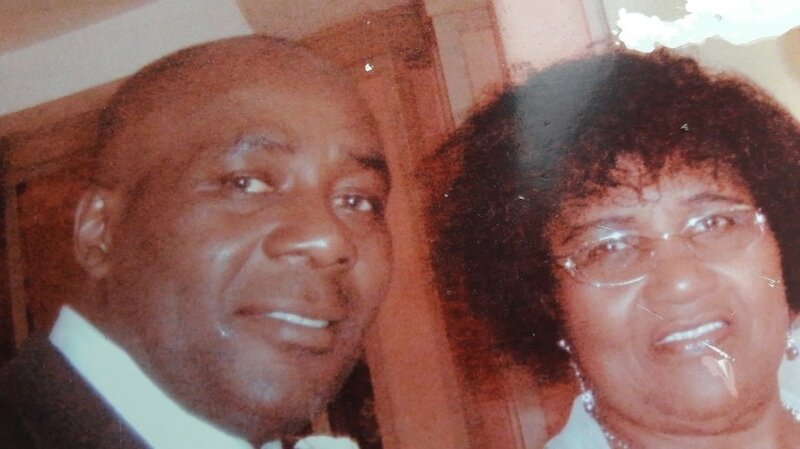 My mother joined a Black community in Derby, to work in the NHS. This was common practice in the 1950s. Many Caribbean people of my age share the same experience. Our parents answered the call from Britain to come and help rebuild the services after the war. We were all raised to feel our belonging to the ‘Mother country’ and that we would at some point tread the ‘streets paved with gold’. ​I didn’t know my mother before the age of ten. I have no memory of a childhood spent with her or my father. My grandmother and grandfather, Papa Taylor, raised my sister and my cousins. I was born in 1955 in the Parish of St Ann, and grew up at the ‘fort’ and then in a village called Old Road. My father, Wallis Halliday, moved to the U.S.A for work. This was also very common. I have a whole other branch of my extended family in the States. 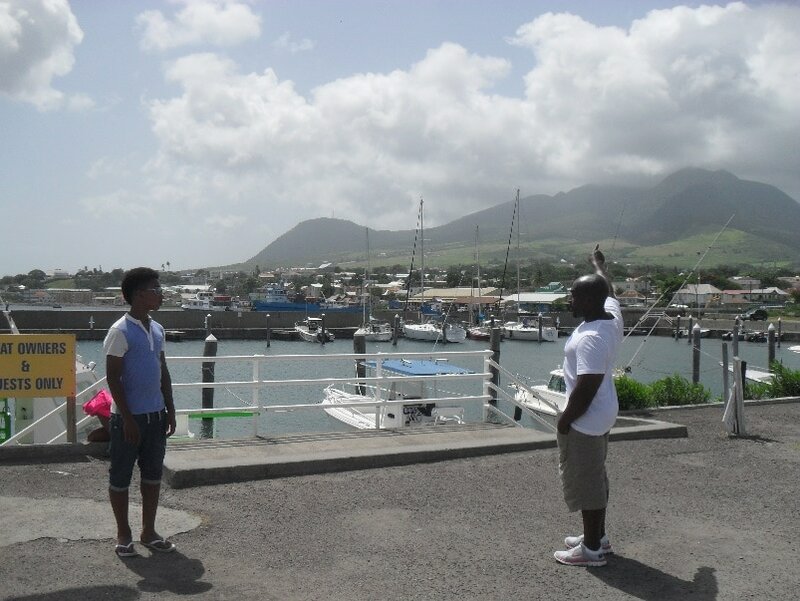 ​I look back on my childhood in St Kitts with very fond and happy memories and describe it now as ‘idyllic’ to other ears. Amongst my favourite memories are a completely natural way of life. I picked mangoes growing wild and in abundance, which I then went into town to sell, as a boy. I tended my own little vegetable plot to do the same. I made my own tools to look after my little garden. I recall fishing every day with a homemade stick and string. 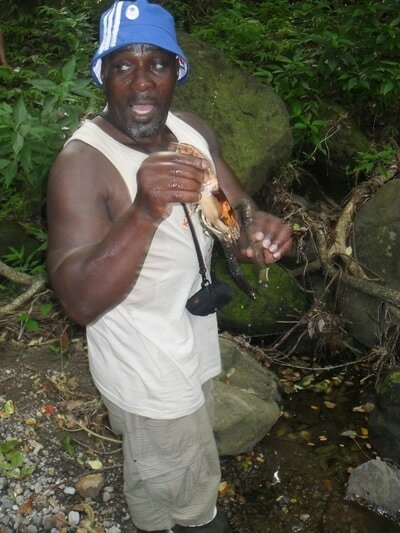 I used to go into the mountains to catch land crabs and carry them home in sacks for the cooking pot. I kept some crabs back and would smash them against the rocks in rock pools to draw the eels, which I would then bag up and take home. I can still vividly remember the crabs’ pincers pinching my back and bottom as I carried them home in my little handmade sack. I swam in the sea every day with my cousins. I had no sense of danger, as I would run across the airfield and dodge planes to get to the other side, to play in the sugar cane fields or in the rainforest on the mountain. I could roam free as I wished. One of my daily chores was to take a packed lunch to my grandma who was labouring in the sugar cane field all day. Of course, now I know that was back breaking work for any adult but I had no sense of it then, nor of the legacy of slavery. Maria, my grandmother, was a very strong jet-black woman. My papa, her husband, called her the ‘Conga woman’ as a joke, so now we all take it mean that she came from the Congo region of Africa. She herself told us that her people were Santo Domingas. We now realise her predecessors were Haitian slaves. She was illiterate. She never went to school, I later came to learn. She told us her grandfather and grandmother were slaves. So, her parents were born into slavery. My grandmother was therefore a child born of slavery. My grandmother, Maria, was named Maud Taylor-Ward, and was born in 1908 on the Brighton Bay Estates in St Mary Cayon on the island of St Kitts. She was told that she was born in the longhouse while the ‘massa’ lived in the Great House on the plantation. She said that her paternal grandparents, who she was close to, were ‘Congo’ people and she described how they would dance to the sound of drum beats. ‘Congo’ people was a term used throughout the African diaspora to describe newly arriving Africans to the Caribbean. Although the British abolished the trade in slaves in 1807, many people were still stolen and extracted from the African continent and brought through the infamous ‘Middle Passage’ to the Americas. Slaves of the British colonies were finally granted emancipation in 1833. My grandparents Maude Ward and 'Papa' Nehemiah Taylor wed in 1939. Together they had eight children, the third-born, Catherine is my mother. Papa was a carpenter and was able to find plenty of work. He was a light skinned Black man who my mother says had Chinese forbears. I remember him as stern. His harshest punishment was to hit me across my buttocks with the flat edge of his saw. By all accounts I was quite a wild child. I frequently dodged school to do my own thing; the usual, exploring playing, growing and making things - which I saw then as far more important. I loved wildlife and liked to ‘fix’ broken creatures I found. I remember looking after baby birds I found fallen out of nests and fixing a bird’s wing by making a little splint. I loved the outside life. I liked to make my own little tools and build what I needed. But I wasn’t a loner. My life was rich with play and exploration. 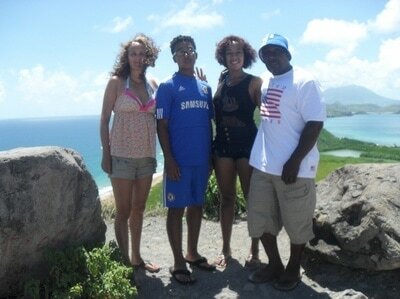 I loved learning from what I could see around me, joined by my sister and cousins. I was known as ‘sunny man’ of our village. That was my nickname. I had a little round belly since I was called for dinner at all the houses. I never felt hunger of the stomach or soul. ‘Papa’ Nehemiah Taylor, my grandfather. 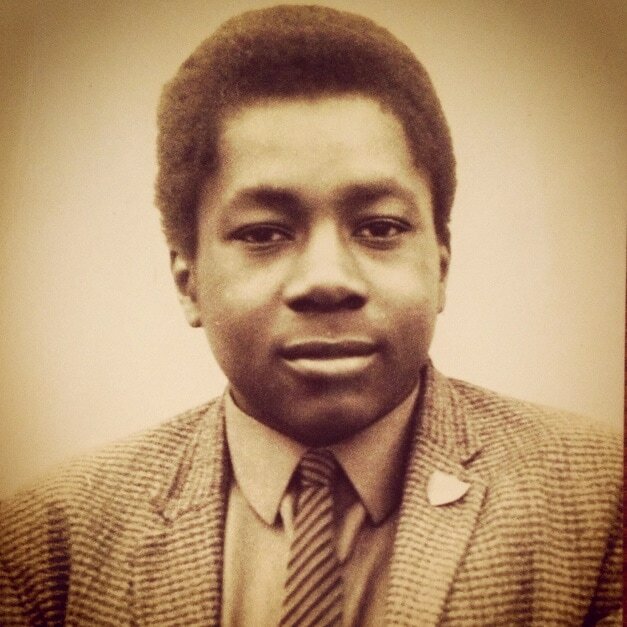 Myself, Kenneth Llewellyn Fox, aged 16, as a prefect at Dale Secondary School, Derby. ​I arrived in England for the first time at age ten, and was met by mother and her new husband with four sisters and a brother. My Kittitian sister had been sent for ahead of me. But my new family I had never met. Imagine that for a moment. But it didn’t feel strange. They were my family, and as pleased to meet me as I them. Upon arriving in Derby, our home town, I was so excited to kick off my shoes and run outside to play, as I was used to. However, my mother told me “no! you can’t do that now you are in England, son!” Yes, that was the first of many changes I didn’t take to too readily. Another memory that amuses me now was going swimming with my new school for the first time. I had been told about it and could barely wait for so much excitement and anticipation. I ran out of the changing room and jumped into the pool immediately… with my socks still on! Further fun I had in that first week at school was the delight of being sent to school with my lunch money in my hand to pay for the week ahead. But I didn’t do that. I spent it all on Dinky toy cars, but then expected to eat for free all week. I daren’t tell my mum and school didn’t tell her, so I had to go hungry all week. So, that was in fact my first experience of hunger of the stomach. Hunger of the soul came with my first experiences of racism. ​Actually, I made loads of friends at school from all corners of life and I still have those childhood school friends today. Amongst my favourite experiences are playing football all day long at the weekends. As a young man, I played in an all ‘West Indian’ football team against many other local teams at the parks. 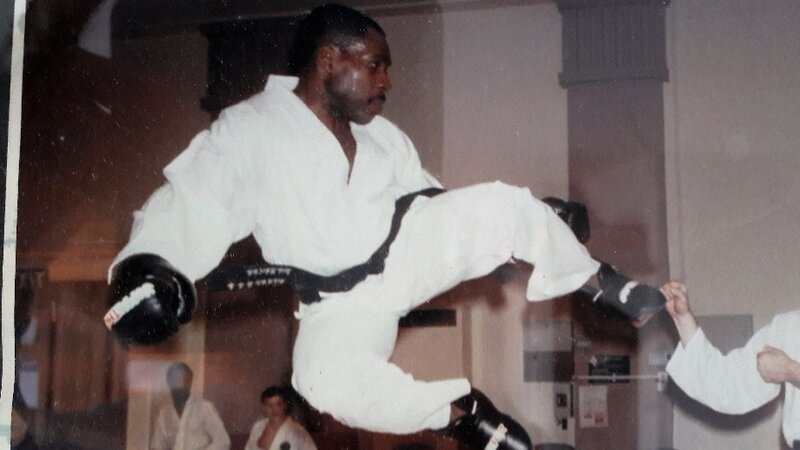 Aged 16 I took up Taekwondo, which I practiced diligently and later became 3rd Dan Black belt and ran four of my own martial arts schools in the city. Through this I learned to be humble, walk away from fights and earn a different kind of respect. I started at the gym at age sixteen too and have been very fit and extremely strong all my life. ​Sadly, at age 16 came another life shaping change. I was at school and hoped to go to college to study Technical Drawing. I was very good at it and loved the precision of measurements and design making. But my stepfather, who had adopted me and from whom I gained the surname Fox, was abusive to my mother and I would defend her. One day it came to a head when I stopped him from hitting her and he told me there cannot be two men in the house. So, I had to leave. I remember spending several days sleeping rough on the streets and coming to mum’s back door at night to be fed in secret. My mum gave me the address of my paternal grandmother in London and told me that she would accept me if I went to live with her there. This period is my biggest regret in life. Through this, I missed an opportunity to train in technical drawing which I absolutely loved and exceeded at. This began a period of me trying my hand at every job available. I had always been resourceful and able to stand on my own two feet. I was very independent and not thrown into chaos. I rustproofed cars, tried aluminium smelting, building, landscape gardening, painting and decorating, security guarding and working as a ‘doorman’ for pubs and clubs. After two years I returned to Derby fully able to support myself. I married young for the first time and had my first child, a daughter, at age twenty-one. I went on to have eight children in all, four boys and four girls and married for a second time. ​It is due to my second marriage that I live in East Yorkshire. I married in Beverley in 1990. This is where my wife’s parents live. Her father was in the British Army and their last posting was to Leconfield. So, they settled in Beverley. My wife went to Nottingham University age 18 and then to Derby after, to do her teacher training. She teaches at a local Beverley primary school. Our children went to local Beverley schools and Hull University. It is in Beverley, where I have finally found my true vocation. Like my Papa before me, I am a qualified and skilled carpenter and joiner. I attended East Riding College and gained all the qualifications I needed. I find it amusing that I need that piece of paper to prove my skill when really, I am qualified through my life experiences but I needed it, so I got it. I make beautiful wooden furniture for a local company ‘Alexander Ellis’, formerly known as ‘Beverley Pine’ and Farmhouse Furniture. It gives me a great sense of satisfaction to know that hundreds of families all over our local area, the entire country and indeed abroad, enjoy using my handcrafted furniture and bespoke designs. Sometimes I get the opportunity to deliver, fit and assemble my furniture in people’s homes and I love to see it all sitting there as peoples’ prized purchase. I don’t explain that I actually make it. It is enough for me to feel the great pleasure I take in making it. I am at my happiest in the workshop. I even have a workshop at home, where I make furniture for family, friends and ourselves. I tend our beautiful garden and love to maintain our own home. I keep ferrets and have a cat. Funny how things seem to have come full circle. I have recreated my own Caribbean paradise in a little corner of Yorkshire I can call my own. My family photographs. Click on each photo to enlarge.